ESA's LISA Pathfinder lifted off earlier today on a Vega rocket from Europe's spaceport in Kourou, French Guiana, on its way to demonstrate technology for observing gravitational waves from space. Gravitational waves are ripples in the fabric of spacetime, predicted a century ago by Albert Einstein's General Theory of Relativity, published on 2 December 1915. Einstein's theory predicts that these fluctuations should be universal, generated by accelerating massive objects. However, they have not been directly detected to date because they are so tiny. For example, the ripples emitted by a pair of orbiting black holes would stretch a million kilometre-long ruler by less than the size of an atom. The Vega launcher lifted off at 04:04 GMT (05:04 CET). About seven minutes later, after separation of the first three stages, the first ignition of Vega's upper stage propelled LISA Pathfinder into a low orbit, followed by another ignition about one hour and forty minutes into the flight. The spacecraft separated from the upper stage at 05:49 GMT (06:49 CET). Controllers at ESA's operations centre in Darmstadt, Germany then established control. 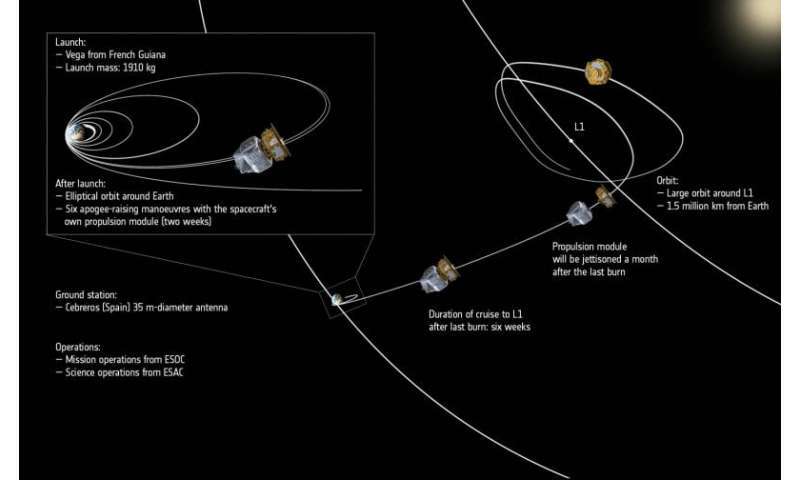 Over the next two weeks, the spacecraft itself will raise the orbit's highest point in six critical burns. 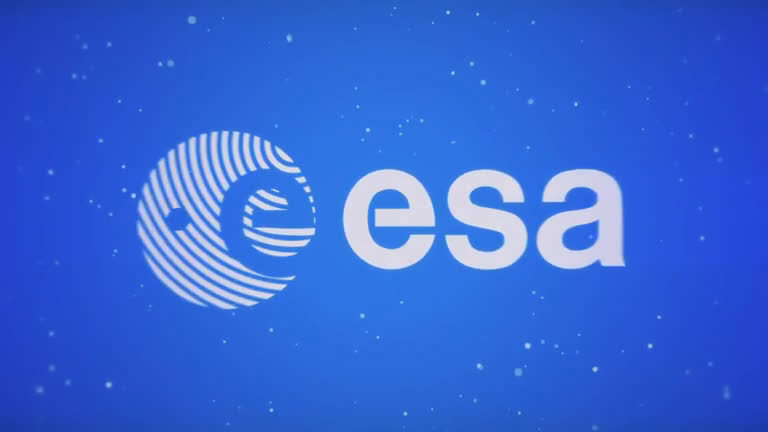 "Fundamental research tries to understand our world," says Johann-Dietrich Woerner, ESA's Director General. "Einstein' s theoretical findings are still very impressive. 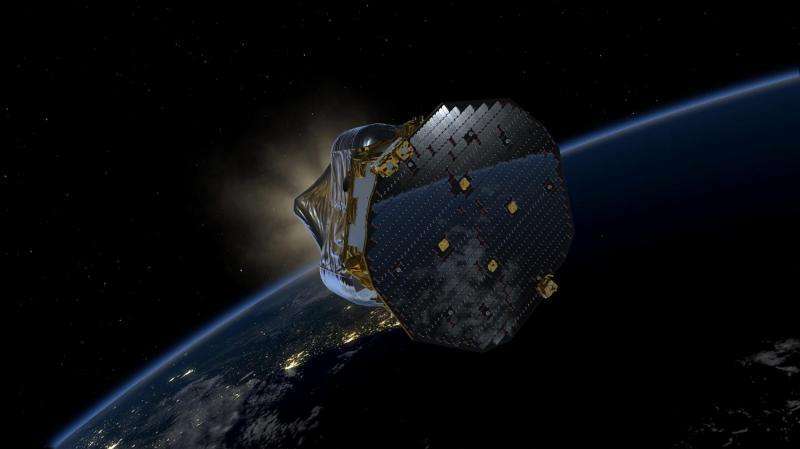 With LISA Pathfinder we will try to take a further step towards confirmation of one of Einstein's predictions: gravitational waves." "Gravitational waves are the next frontier for astronomers. We have been looking at the Universe in visible light for millennia and across the whole electromagnetic spectrum in just the past century," says Alvaro Giménez Cañete, ESA's Director of Science and Robotic Exploration. "But by testing the predictions made by Einstein one hundred years ago with LISA Pathfinder, we are paving the road towards a fundamentally new window on the Universe." 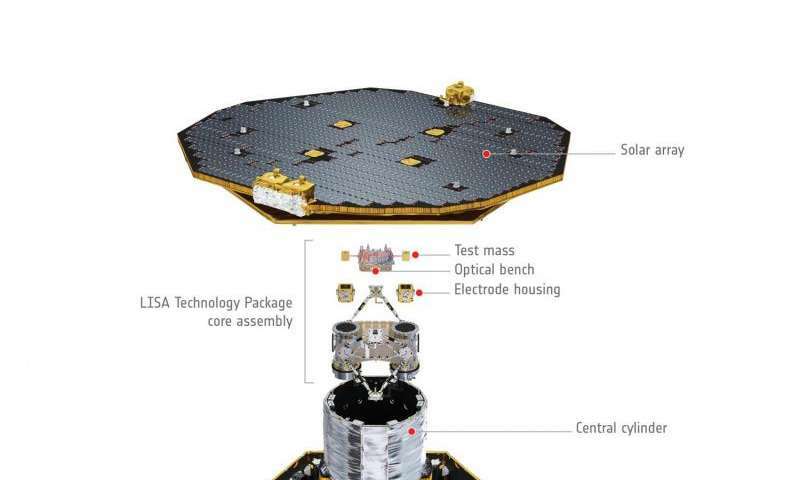 LISA Pathfinder will operate as a physics laboratory in space. Over an intense period of six months, mission scientists will analyse the data received on Earth from each day's operations to plan the experiments to be performed on the satellite during the following days. "After many years of development and testing on the ground, we are looking forward to the ultimate test, which can only be run in space," says Paul McNamara, ESA's LISA Pathfinder project scientist. "In a few weeks, we will be exploring the very nature of gravity in space, gaining the confidence to build a full-scale space observatory to study the gravitational Universe in the future." An industrial team led by the prime contractor, Airbus Defence & Space Ltd, built the spacecraft. Airbus Defence & Space GmbH provided the integrated LISA Technology Package payload and a consortium of European companies and research institutes provided its subsystemsNASA provided additional hardware and software that contributes to the mission by validating an alternative technological approach to keeping the spacecraft from making contact with the test masses. "Integrating LISA Pathfinder posed many challenges, and we are extremely happy to see our trailblazing machine finally in space, ready to embark on its journey to L1, where it will pave the way for a new class of future space projects," concludes César García Marirrodriga, ESA's LISA Pathfinder project manager. The launch of LISA Pathfinder was the last of five flights intended to demonstrate the capability and flexibility of the Vega launcher system, as part of ESA's Verta – Vega Research and Technology Accompaniment – programme.